Last weekend, Cheryl made chart history with her fifth number one single so it seems to be only right to blog about another of her recent successes and that’s her début fragrance, Storm Flower. Being from the North East, I am a huge supporter of Cheryl and couldn’t wait to try her perfume, although I didn’t have any idea what kind of scent she would create. I was intrigued by it to say the least. After wearing it for a couple of weeks, it is definitely a hit with me. 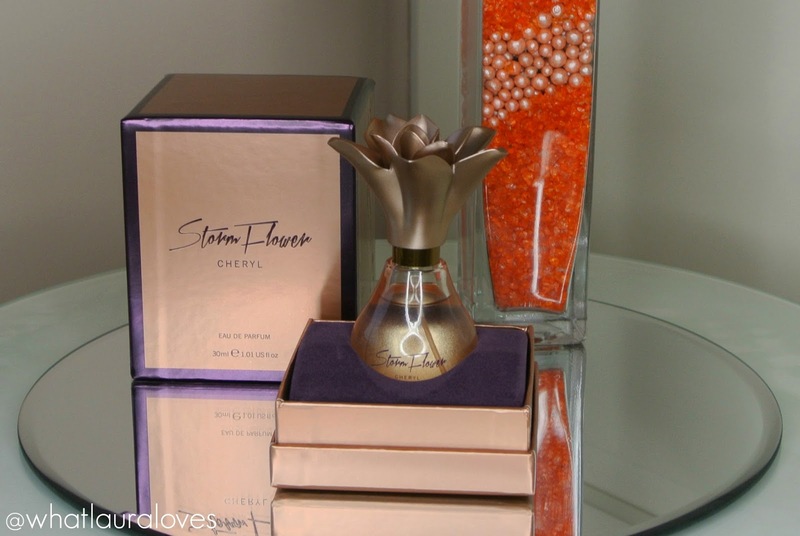 Storm Flower is a very feminine, fruity-floral scent that smells different to any other fragrance I have smelt before. It has fruity top notes of mandarin and nectarine, floral heart notes of freesia and peach blossom and base notes of vanilla which give the scent a little warmth and sweetness, and my favourite notes in fragrances- white musk and sandalwood which give the scent some depth. I really like the smell of this perfume because although it is fruity, it has an air of sensuality about it too. The one thing that really struck me about this fragrance is that it is pretty long lasting which is something I do not usually find with celebrity fragrance releases as many are eau de toilettes rather than eau de parfums like this one is. It is a scent I wear during the daytime as I do prefer much heavier scents at night, such as Pomegranate Noir from Jo Malone however Storm Flower has just the right amount of punch for daytime wear for me. For A LOT of people, I think this would make the ideal evening scent but personally, for me, it is a daytime favourite. The packaging is classy, understated and chic, combining rose gold with a deep purple. Unlike so many celebrity fragrances, it doesn’t have a photo of Cheryl all over the box, it simply has her name underneath the name of the fragrance and there is no other obvious branding on the packaging design. I think that this is a smart move as it would encourage others who aren’t fans of hers to try it and I would recommend anyone to give it a sniff as it certainly isn’t what I was expecting. I thought this would be a sugary sweet plastic scent, a stereotypical celebrity fragrance if you will, but it isn’t at all. It has a lot more depth to it than that and the scent itself is more complex. The bottle is a beautiful shimmery rose gold and has a rose gold exotic flower as a lid that looks particularly large and slightly tacky when on the smaller 30ml size bottle that I have. This would make a lovely gift for a woman, especially with Christmas coming up and I would particularly recommend it for those in their late teens and early to mid twenties. Storm Flower is very affordable, especially when bought from Fragrance Direct and comes in a 30ml and a 100ml size on this particular website. Fragrance Direct have lots of other perfumes and Christmas fragrance gift sets available so they really are a one stop shop that will have you smelling amazing over the festive season. 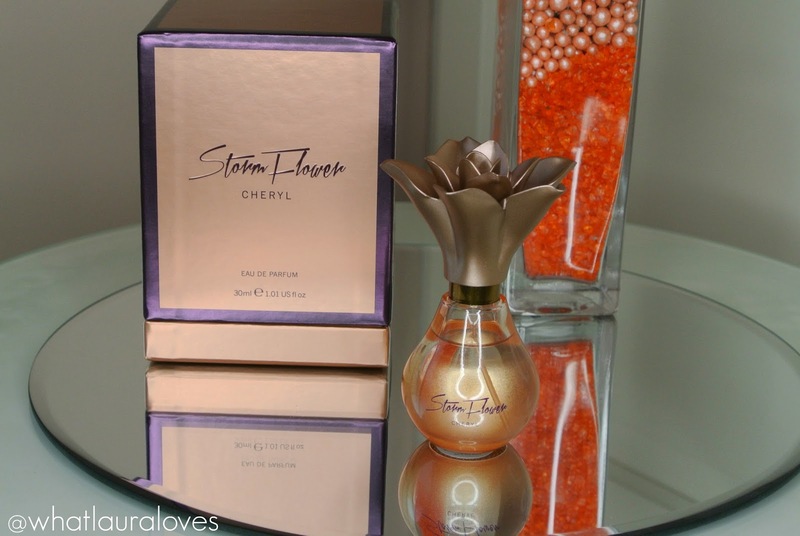 What did you think of Cheryl’s Storm Flower perfume? What do you think about celebrity fragrances? Previous Post News From Strictly!